Wow.. it's not every day you get something for nothing, but you certainly do here. 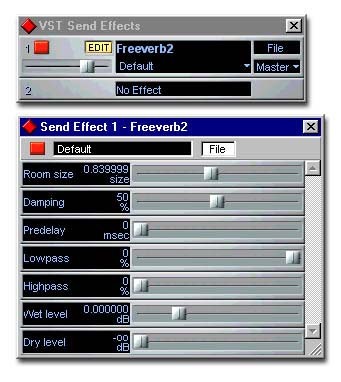 What is there to say, it's a VST plugin effect, called FREEVERB.. and it's free... um... and it comes in 4 fruity flavours: PC-VST, Mac-VST, Direct-X & Linux even. !!! No fancy stuff with Freeverb, just the standard VST grid/sliders panel default like you get with some DB plugins... you can see from the image what they are cos the image above is fullsize, and the thing is, as the author claims, he's designed the algorithms for the verbs based on tuning them by ear, not mathmatical tables... This mysterious 'Jezar' character, who is the author from the company Dreampoint, is supposed to be a well experienced engineer & producer and tuned the 'verb to sound right and offer low resources... it certainly does run light compared to other 'big' 'verbs you can get, and the sound IS as good as they claim... ulp!! I dl'd freeverb a week ago. Very nice and smooth. The Freeverb I dl'd was from Cakewalk's website and has only 3 parameters. Would like to get my hands on the one pictured above. Mine, with only roomsize, damping. and mix is really refreshing to use. my own comparisons. GET IT NOW. And thanks to Dreampoint's Jezar! I would love to give a comment on this software- I never got it downloaded to try. did not see any place on the website to initiate a download.